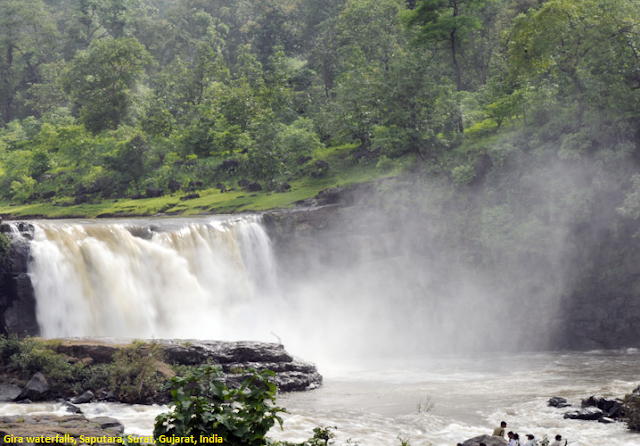 Gira falls in Waghai are a set of picturesque Waterfalls (100 ft fall) on Ambika River. Breathtakingly beautiful around monsoon, these seasonal (only after rains) falls are among the most picturesque sights in the district. Located about 3 km from Waghai town, It is open to public and accessible by jeeps on hire. The town of Waghai is 51 km away. Ahmedabad: 409 km. Surat: 164 km. Mumbai: 250 km. Vadodara: 309 km. There are State Transport buses and private luxury coaches from Waghai and Ahmedabad. If you are coming by a private car, than National Highway might be quicker, but the state highway will offers a stunningly scenic drive. On days with a clear sky, you can actually spot a rainbow right above the waterfall. During the monsoon season, there is a heavy flow of water in the falls and this perhaps is the best time to visit the waterfall.